The Longman Children's Picture Dictionary presents 800 words in a variety of richly illustrated and photographed topics. The dictionary is designed to appeal to young learners and can be used at home or in class. Each of the 50 topics comes with a song or chant by Carolyn Graham. - 800 words or phrases categorized into 50 topics. - Two CDs including all vocabulary, dialogs, songs and chants. 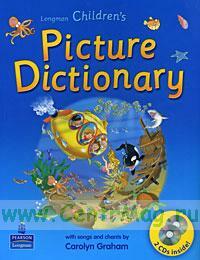 - Activities to practice vocabulary and dictionary skills. - One to four dialogs per topic for vocabulary substitution. - A song or chant for every topic. A comprehensive index including word list, dialogs and lyrics to the songs and chants.